Background: Although Pichia pastoris is an outstanding host among conventional expression systems for production of recombinant proteins, a new interest has been emerged to this system due to the inherent advantages and new developments in this expression host. The potential for secretory and soluble expression of heterologous glycoproteins in P. pastoris proposed this system as a candidate for the production of complex eukaryotic proteins. Methods: Several new developments have occurred in different areas related to P. pastoris expression system including hosts, vectors, glycosylation pattern and fermentation technology. 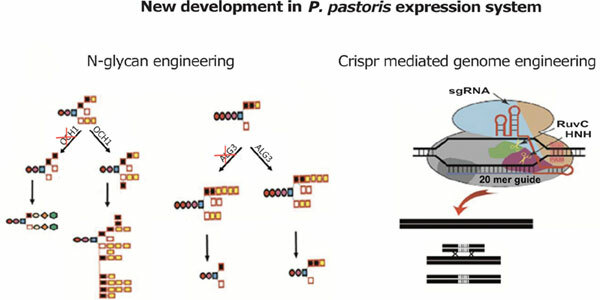 Strain engineering using Crispr/Cas9 technology to produce human-like glycoproteins and protease deficient strains are two new areas of development with high importance. Results: This review is dedicated to discuss the most important characteristics of P. pastoris with emphasis on new developments, especially in the field of glycoengineering, efficient expression vectors and promoters. Conclusion: New developments that occurred in the P. pastoris expression system converted this system to a versatile host for the production of complex proteins. This progress paved the way for several proteins to enter the clinical trials or industrial processes with this valuable expression host. Pichia pastoris, expression system, recombinant protein, glycoengineering, Crispr/Cas9, genome engineering.